The UNC Highway Safety Research Center (HSRC) is continuing its work in developing guidance on accessible pedestrian signals (APS) to optimize safe and independent crossing at signalized intersections by pedestrians who are blind or have low vision. Having completed the research, HSRC is now conducting workshops in various venues around the nation to disseminate the guidance on APS design and installation. The APS Workshop is designed for traffic engineers and administrators, signal technicians and orientation and mobility professionals. The one-day workshop is comprised of seven modules that address the needs of the audience. The workshop consists of six hours of instructions in which participants may be eligible for six professional development hours (PDH). The APS Workshop is designed to equip attendees with the knowledge and tools to understand the purpose of APS installations and how blind and low-vision pedestrians travel. Workshop attendees will also learn to plan, design, install and maintain APS systems. "This was one of the best workshops I have attended over the last 15 years. Presenters were very knowledgeable of the material presented," said one past attendee. The APS workshop was developed under the National Cooperative Highway Research Program (NCHRP) Project 3-62 (Guidelines for Accessible Pedestrian Signals). This research study used extensive field testing to determine which APS features and locations are most beneficial for blind and visually impaired pedestrians. Under this research study, the Accessible Pedestrian Signals: A Guide to Best Practices reference book was developed and will be provided to all attendees of the workshop. NCHRP supplies the cost of all materials and the instructor's time and transportation. Interested agencies are asked to provide a room, multimedia projector and screen for the workshop, as well help with logistics. For more information regarding the workshop or to schedule your agency, please contact Daniel Carter at 919-962-8720 or daniel_carter@unc.edu. 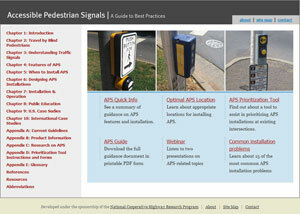 Directions is a free, online publication of the University of North Carolina Highway Safety Research Center. No permission is needed to reprint from articles, but attribution is requested. To receive Directions, please subscribe to the HSRC contact list.